OSTER, CONVECTION TOASTER OVEN, BROILER. 6293. From the NEW Inspire Collection by Oster. NOTE: This item Usually Ships Within 24 Business Hours! Home > Toaster Ovens, Broilers > OSTER, CONVECTION TOASTER OVEN, BROILER. 6293. From the NEW Inspire Collection by Oster. - Includes a Special, FREE 60 Page Recipe Cookbook entitled "The Art Of Food", which boasts dozens of delicious recipes to choose from. - Double wall construction for better heat retention and cooking performance. - Two rack positions to accomodate a wide variety of foods from tall roasts to pizza pies. - Auto Advance rack for safe and easy removal of cooked food. - Convection Technology for faster more uniform cooking. The Oster family of high quality small kitchen appliances cover a broad spectrum of products including: Toaster ovens, breadmakers, convection toaster ovens, broilers, frying pans, arepa makers plus more. 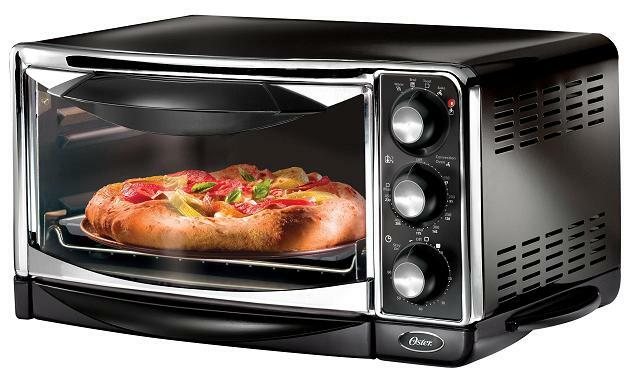 Now you can cook some of your favorite recipes with this Oster toaster oven. The Oster company supplies broilers and many other small kitchen appliances worldwide. Here at AAWSales, every one of our items are discounted and always on sale. And to show our appreciation, we also have VALUABLE FREE THANK YOU GIFT PACKAGE offers for our customers!